Saturday we came home from our beach vacation. It was nice sleeping in our own bed again. Seeing our pets was a welcome sight. I sure missed my babies! Brandon's girlfriend, Jenn took care of the house and pets. She had to spend the night because of our dog, Teddy. Teddy has diabetes and gets up a few times in the middle of the night to go potty. His bladder cannot hold out all night long. Teddy is almost blind. He needs someone to direct him so he doesn't run into things or fall down steps. We came home to a spotless house. Jenn did a fabulous job! Zachary has been searching all summer for a job. He has had quite a few interviews with no luck. While we were at the beach, he got a call from Walmart. This is Zachary's first job. I can imagine his face when he gets his first paycheck and sees how much taxes are taken out. Welcome to the real world kid! I read two books while I was at the beach. I am a fast reader. It rained Thursday, so I spent the entire day reading and got one book done that day. The week before we left for the beach, I took a horrible fall. I do not recommend falling on concrete and sliding onto macadam. My leg looked like someone scrapped a knife down it. Both of my feet had holes on the top. One hole was so deep, you could place a dime in it and it would be flat with my foot. Really nasty looking. Probably should have gotten stitches. The cuts did not heal enough for me to go on the beach. I was afraid of the sand getting into the gouges in my feet (yes, they really were that bad). It looks infected in the picture, but that is really the scab process beginning. Everything is healing now. I think I will have a nasty scar though. Friday Fragments are things that happen in your week that are short and sweet. Come join us at Half-Past Kissin' Time and let us know what you were up to this week! Ouch! 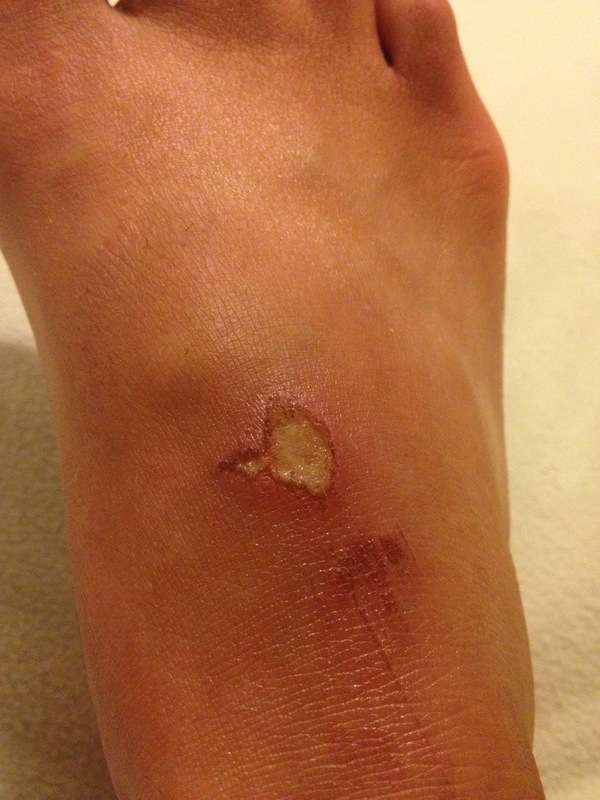 Glad your foot is healing. That's great when you can get someone to stay at your home with your pets. Especially when they have special needs like your Teddy. My sister-in-law used to come stay at our house to take of our pets if we went somewhere. But she just recently got married so we lost our built in pet sitter. Boarding is so darn expensive! Luckily, depending on how you look at it, we don't go away much. I hope your injury heals quickly. Have a fabulous weekend! Nice to have a house sitter to take care of the fur babies... my parents have to take care of ours when we're gone. Ouchie booboos! Glad y'all had fun and are glad to be home. I think you jinxed me Kerry! Macadam is the black stuff that paves a road or parking lot. Boarding is very expensive, and I have 2 dogs!